When Ann-Marie Brewer stubbornly ignored her mother’s words of wisdom and forged ahead with her marriage she quickly discovered just how difficult marriage could be. 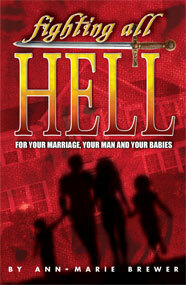 All hell broke loose shortly after she said “I do” – so much so, she cried out to the Lord in total desperation. Not only did the Lord answer her cry – He cleaned her up her life, taught her how to be a mother and wife and showed her the precious promises in His Word for her marriage and family. God blessed her with the marriage she had longed for in His timing and in His way.